I was in the garden today getting some veg for tea. 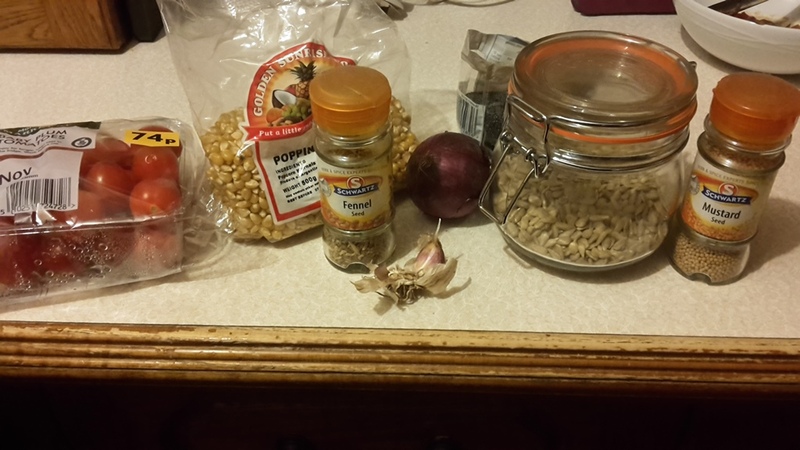 I decided I was going to cook a stew with the brace of pheasants I brought home from the shoot on Saturday. 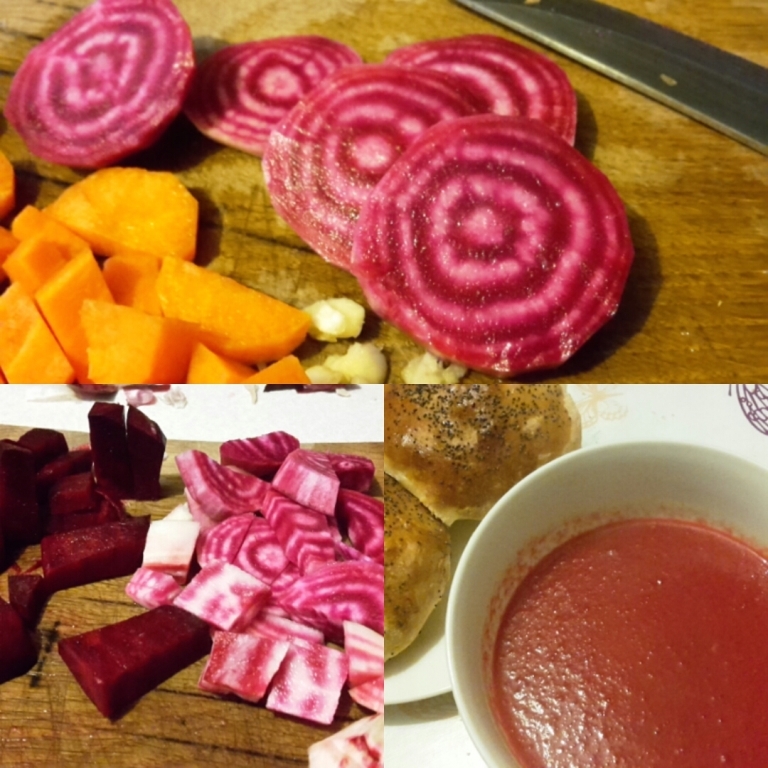 I managed to get pretty much all the ingredients from the garden. 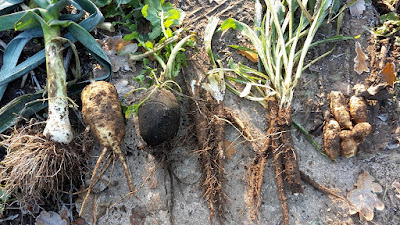 The veg in the picture above is (left to right) leek, parsnip, black Spanish radish (a cooking radish) salsify, scorzonera and Jerusalem artichokes. I added a bunch of herbs from the garden and some potatoes I've got stored in the shed. I've not tried Salsify or scorzonera before and I was very impressed with how they tasted (I'll do a post on them another time). The Black Spanish Radish on the other hand isn't doing very well at winning me over at the moment. It's easy to grow and sowed really late, but tastes very bitter, even when cooked. So far we've tried stewing it and roasting it and both times I've left most of it on my plate and the girls haven't touched it. It's a real shame we're not liking the taste as it's so easy to grow and being late in the season means you can grow it when another crop has finished. 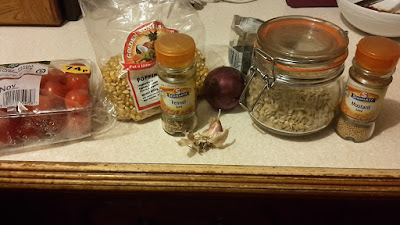 I was under the impression that it was meant to be fairly mild when cooked and a good bulking vegetable in soups and stews, to me it almost taints the whole dish. Does anyone else grow this vegetable? 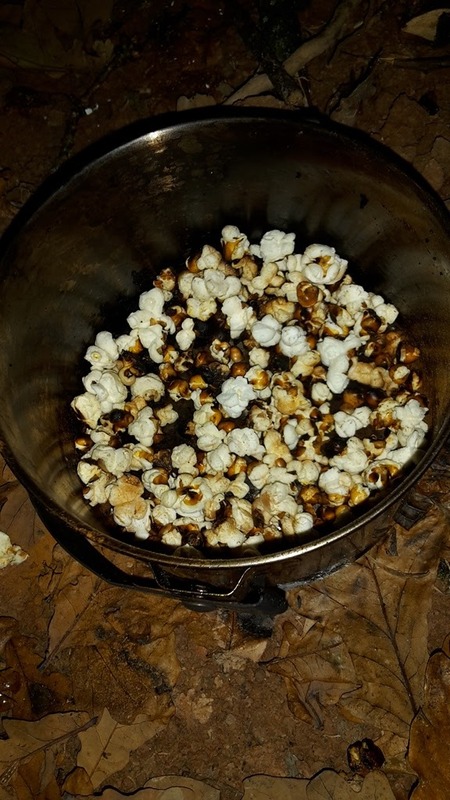 What am I doing wrong when I cook it? On the shoot on Saturday there was a section in the between two parts of the woods that had been sown with a cover crop. 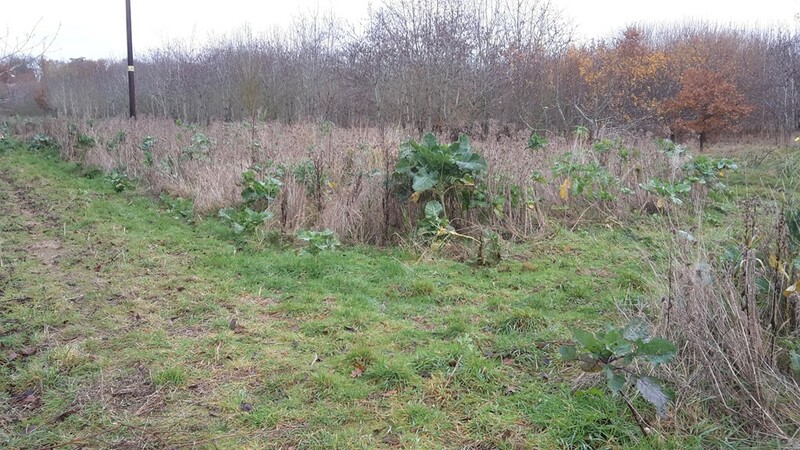 In amongst the weeds there were hundreds of kale plants standing about 4ft tall, I'm afraid my picture isn't very good but you can just about see a big kale plant on the end of the row. When I asked about this one of the guys who runs the shoot said they cleared this patch of land and sowed some kale five years ago, since then they've left these patches to their own devices. The plants have been growing, flowering and setting seed all by themselves, despite the heavy weed competition and how it's bound to have been predated on by bugs and birds. 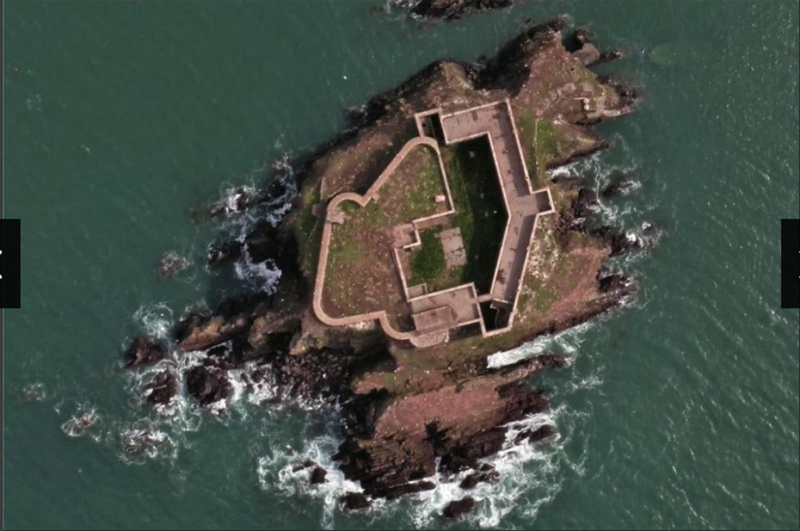 It just shows that if you can find a bare patch of land that's not going to be touched then a guerrilla type gardening style could help to feed you! What plants do you have that keep coming back year after year from self set seed? I had a great days shooting today. I didn't take many pictures today - this is one from last time! Back in the summer I worked on a hotel extension and worked with a cracking group of lads (I've mentioned them before when I went clay shooting a few months back). One friend I made is really keen on his shooting and when he heard that I liked to shoot he invited me along for a days shooting. I jumped at the chance! This shoot is just the other side of the hill from me and was set in some beautiful countryside and woodland, as always it was just a joy to be outside, watch the dogs work and have some good company, but I did manage to shoot a few pheasants as well. It's also the first time on a shoot where I've had an offer of marriage! 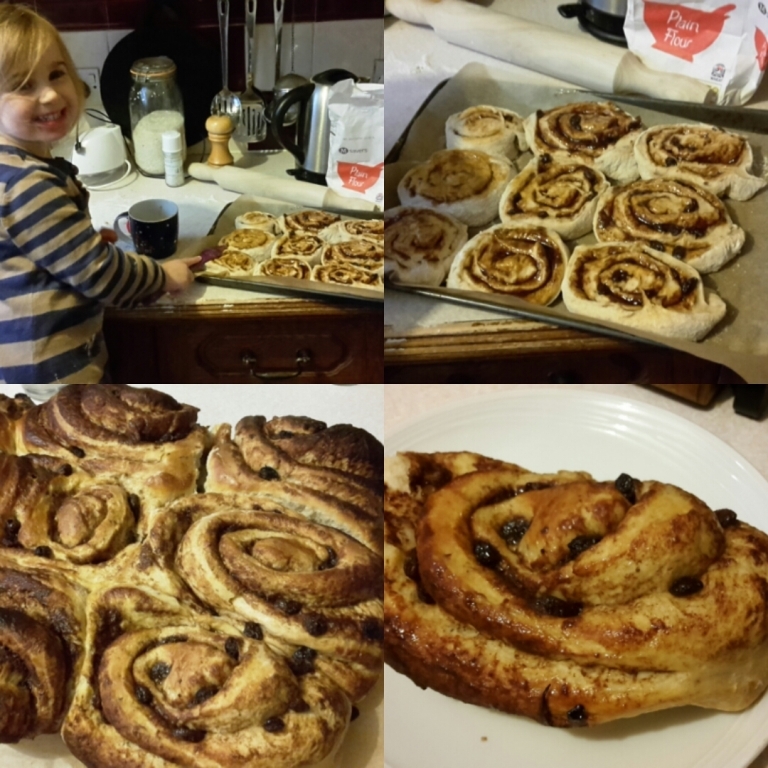 This happened when I brought a full tray of Chelsea buns that I baked this morning with me, covered in icing. To start with they wouldn't believe that I made them, and then, once convinced, people were offering to buy trays from me, before the one guy got very affectionate about my cooking! He wasn't my type anyway! They seem quite keen for me to come back on another day, good cake is always a good way to make friends and influence people! The bag today, not huge but every bird collected - 12 brace of pheasants, 2 brace of pigeons and a squirrel. 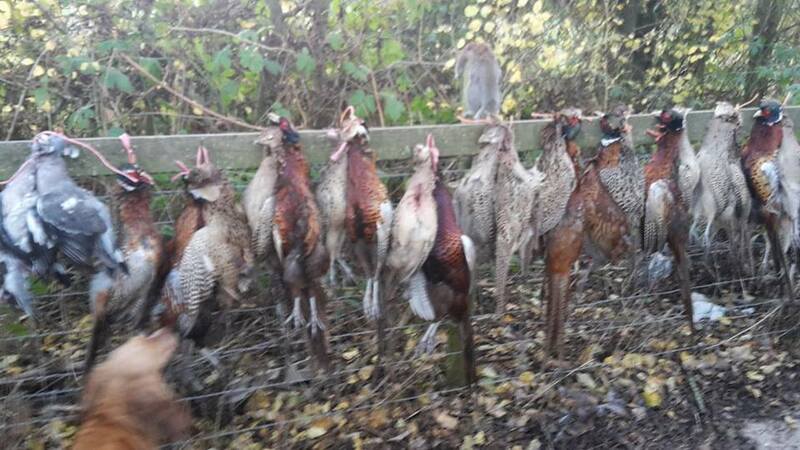 I came back with a brace of pheasants on my shoulder and a smile on my face, a good way to spend a day. Arguing against someone that is against shooting is generally not worth it as both sides already have their minds made up. All I will say is that although you see the product at the end of a days shooting, what you haven't seen is the weeks of work that have gone into maintaining the woodland where we shot by the people that run it. Today we shot around 30 birds but they breed and put down around 400-500 on this shoot every year to have nine days shooting. Spending time in these woods today I could see countless habitats that have been created because of these shoots, big patches of kale and over cover crops that provide food and shelter for far more than pheasants, areas cleared to let young tree grow, wood left to rot to provide habitat for other wildlife. Even the RSPB has said that well managed shoots benefit other wildlife (http://www.telegraph.co.uk/.../Row-erupts-as-RSPB-claims...). This isn't to go into the economical benefits that shooting brings to the countryside. This isn't me looking for an argument, just stating how I feel about something I feel quite passionately about. I guess I'm always courting controversy when I post these type of posts but sod it, this is my record of how I live. Is anyone else going shooting this year or already been? What is your favourite game dish? 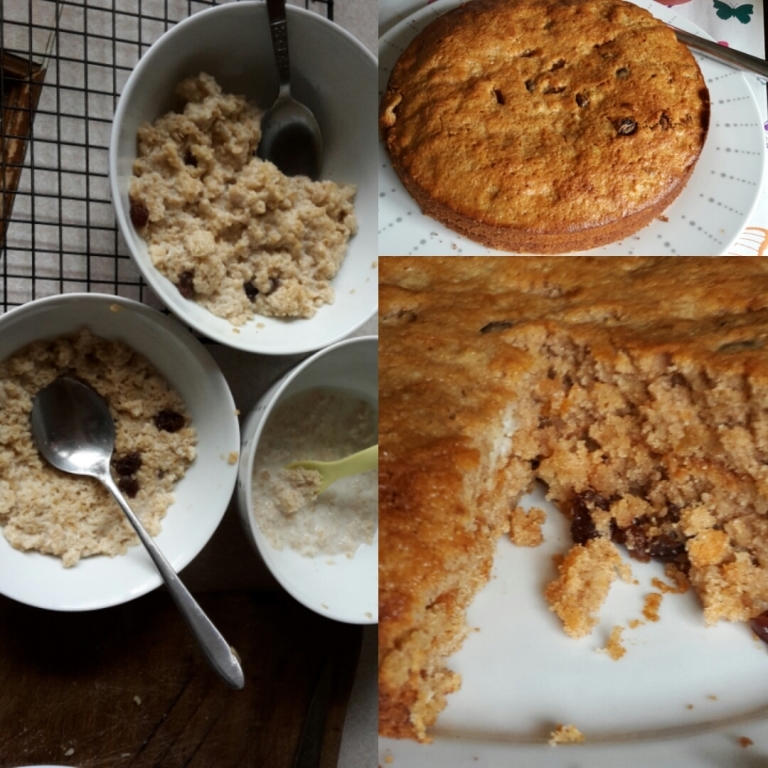 And I give you "leftover porridge cake"
It's impossible to predict how much breakfast my three are going to eat, some days they eat the lot, others they barely touch it. Today they just weren't interested but I decided not to waste it. I invented a very stodgy cake instead. I mixed up half a cup of butter, a cup of sugar, a cup and bit of self raising flour (I'm really that precise!) a teaspoon of cinnamon, 2 eggs and the left over porridge (and out 2 cups worth i think. Oh and a good handful of currents (they're called yeah yeahs in this house for some reason). Mixed it all up and then split it between two 8 inch cake tins. Cooked at 180 until done (about 20 minutes or so) not forgetting to turn your cakes round if your stupid oven cooks more one side than the other like ours does. Then got them out the oven, put a bit of golden syrup on the bottom one and spread it round before plonking the other on top. Tastes pretty good to me! For bonus points, if you want to up the difficulty level of this cake, try doing it with a ten month old child clinging to your leg and using your trousers to wipe his snotty nose on. Makes it far more fun I can assure you. .. I sell my spare eggs each week, normally to friends in the village, either through playgroup or at the school gate (where I feel strangely like a drug dealer trying to push eggs onto people!). Egg shaming picture on Facebook - all good fun. It's been pretty muddy around here lately with all the rain and the eggs are showing it! I've changed the bedding but it soon gets dirty again. I keep getting digs about how dirty they are, all in good humour (and I give as good as I get) but I keep telling them I can't wash them, they keep coming back so it can't be that bad! If you wash them the protective film is washed off as well and then we'd have to store them in the fridge. Apparently most people in the Us store their eggs in the fridge where as over her they're just kept on the side. This article here explains why we don't refrigerate them far better than I could. I do remember fridges having egg racks in them years ago but that seems to have gone now. Do you keep your eggs in the fridge or on the side? Do you wash your eggs before sale? I have fond memories of Chelsea buns from when I was a child (they're kind of like an American cinnamon roll), my aunty owns a pub and her daughter, my cousin, used to bake them, and I remember eating them greedily. On Monday I got back from playgroup ready to divide up some dough to make some rolls but when I opened the machine I saw that I'd done my favourite trick of forgetting the yeast. Bugger I thought. That's wrecked lunch. Luckily we had some wraps in the cupboard so then my mind wondered over what to do with the spare dough. I could have just added the yeast and made some rolls like I had planned to, but I had sweeter things on my mind (and a three year old to entertain), so not only did I add the yeast I also added currants, eggs, and more flour. This I then set to mix again before getting the dough out onto the side. My daughter loved this bit, we then got to roll out the dough before adding a spread made up of brown sugar, butter and cinnamon, with more currant for good measure. 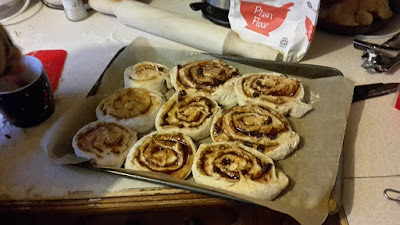 We rolled the dough up and cut it into 1 inch thick pieces, laying them onto a baking tray. 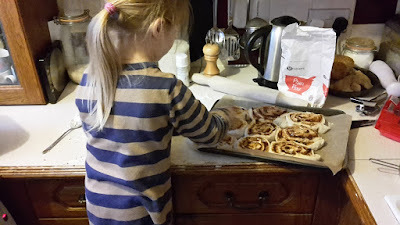 We then had to go and do the school run, I think we were gone a bit too long as they had risen a bit more than they should of, but they cooked fine. With any dough I normally have the oven on full blast and then as soon as I put anything in I turn it down to 200 degrees. Cooked, two did catch a little bit! Some of the bigger ones did catch a little bit, but it made no difference to the taste - They tasted amazing! My eldest was pleased with her snack when she got home from school, in fact I had them all begging me for more once they finished their third of one! 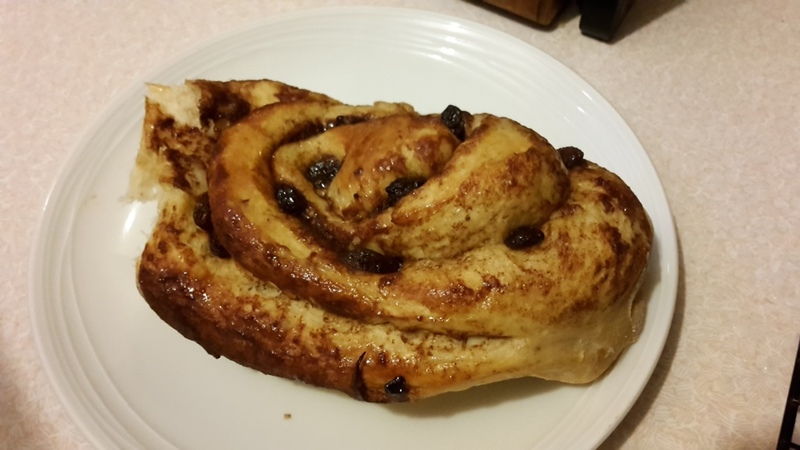 Not bad really when you consider the ingredients probably came to less than a pound! 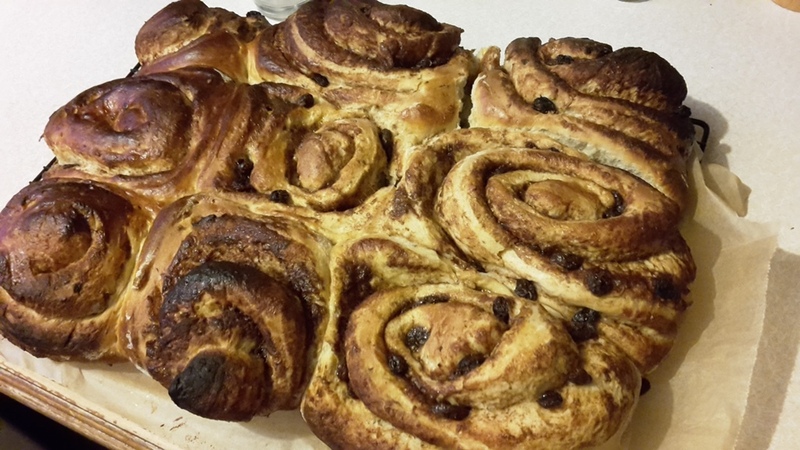 What do you like to bake using dough other than bread? Is there anything you wish you could make? Now I don't tend to plan very much when it comes to meals. They're all homemade, except for Friday where we have a bought pizza that's cooked at home, and normally contain a mix of store cupboard ingredients, garden produce and either meat from the freezer or butcher. As our little family is getting bigger all the time I'm obviously having to cook more and more food. My eldest daughter, who is nearly five now, will eat nearly as much as my wife on a good day, I eat enough for two most of the time and my two smaller children are starting to have more on their plates (although they tend to waste a fair bit of theirs at the moment). As anyone that reads this knows I buy a lot of food in bulk where I can (see the potatoes post here) and having lots growing in the garden helps as well, I'll sometimes just go out there and see what is ready and plan my meals around that, making a particular veg the star of the show. The same is true of meat as well, I'm quite often given pheasants and other game when it's in season as well as shooting some myself, all helping to keep meal costs down (pheasant fajitas are a winter staple here). This picture is from a harvest 8 years ago! But when I look at the cost of an evening meal I tend to budget around the five pound mark if I have to buy things for it, some will be much more expensive (steak from the butchers but with homemade wedges) and many will be far cheaper though (leek and potato soup with home made rolls for example). But if I go into the butchers I know that I can say to him that I want roughly £5 worth of whatever and the rest of the meal is going to cost very little due to how we buy everything else. So what do you budget per meal? Do you meal plan? Saw this property for sale and I thought that there be a few of you on here that would love to buy this place if you even won the lottery! 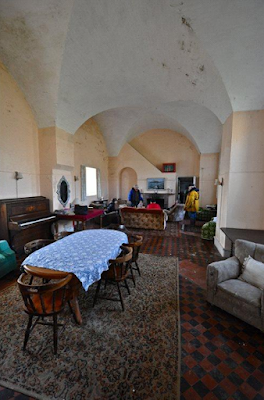 I saw it on Rightmove the other day. 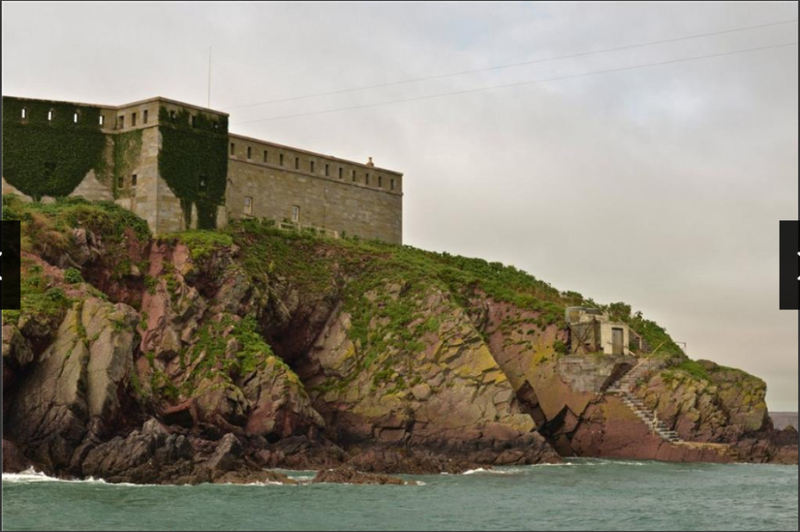 It's your own 2.5 acre island off the welsh coast with a 10 bedroom house, for what I think is a really good price at £550,000. Click on the link to the full details here. 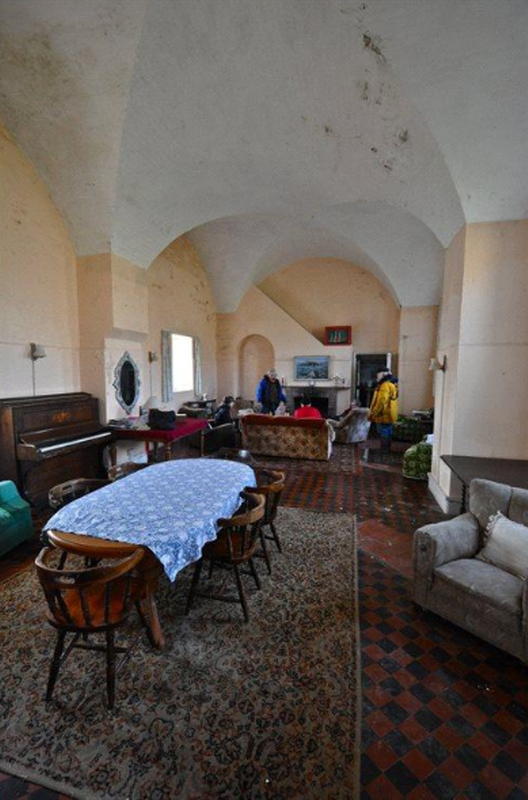 It's listed and needs a massive amount of work and I'd imagine that it would be tricky to get builders and materials out there costing a lot of money. It was an old garrison built in the 1800s, to house 100 men but turned into a hotel in the 1930's. It even has it's own sauna and a garden where you could grow your crops. The perfect island to escape to with a select group whilst the rest of the world burned? 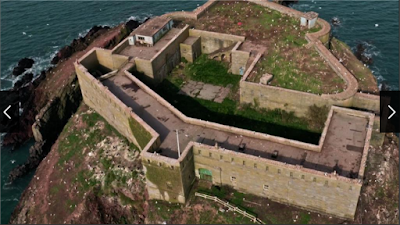 Or would it be too remote for you and Amazon & Tesco's struggle to deliver would put you off? Last night it was my daughters first parents evening. We all went as a family with our rag tag bunch of kids in tow. I was really looking forward to it but there was a slight damper on the evening. Not my daughters reports (apparently she's a pleasure to teach, but I already knew that!) but what happened shortly before hand. I pulled up on the road outside of school and started to get us all out the car. It was getting dark but I deliberately parked under a street light so we could all see. My wife got the girls out the passenger side onto the grass verge as I got my little boy out of the car from the passenger door on the drivers side. I'd opened his door and reached inside to grab his coat, just as I unclipped him the there was a large bang and the car door rocked and there was a shower of plastic over the road. It took me a few seconds to process what had happened. A car had passed our car and hit the door with their passenger side wing mirror and a bit of their car looking at the dents. I looked up and I could see their break lights come on. The boy then started crying from the shock so I bent back down to deal with him, looked back up and I could see they were driving off! I looked at our car and could see they'd dented our door and only missed me by inches. I shut the door twice (as I think they've bent it as well) and handed the baby to my wife and got in to chase after them. Unfortunately another car got between us so I couldn't see where they went and lost them. Probably a good job in hind sight, I was fuming and although I have a good handle on my temper I was shaking at the time. Luckily we weren't injured and it's only a few hundred pounds worth of damage, but the fact they didn't stop to apologise and check they hadn't hurt anyone really disgusted and angered me. I've reported it to the police, although I know there's nothing they can do, and tonight I'm going to park up at the same spot at the same time and see if they come by again. I want them to foot the bill and I want them to gain a few points on their licence. 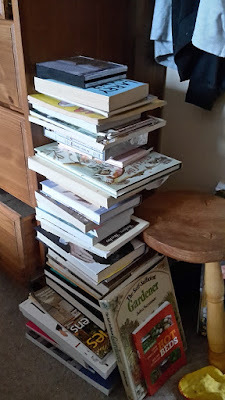 Okay, so most folks reading this blog keep a selection of seeds to grow each year, or if not then keep some in case of an emergency that might result in having to grow some of your own food (financial collapse, zombies, etc). But I was reading something the other day and it made me think about what if I didn't have my collection of seeds to grow from? What then? What if something happened to your supply or you had to leave them behind and at your new location you had to grow food to feed your family? It's amazing when you start looking though there is plenty of things you could grab to grow in the right (or wrong) situation. I started looking in the kitchen and within a couple of minutes found these. Now the seeds are fairly self explanatory, the tomatoes (it could be peppers, or any fruit with a seed in) could be taken and the seeds extracted to be planted. 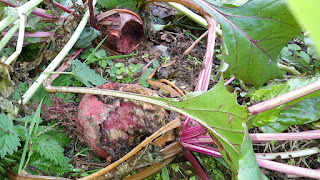 The onion could be planted in the ground and the green leaves harvested, or with the hope that it might go to seed and provide you with the material to grow the year afters crop. The same would be true of any root crop you found, if you got them in the ground then by the end of the next year you'd have more than enough seed to grow all the carrots you could possibly want. 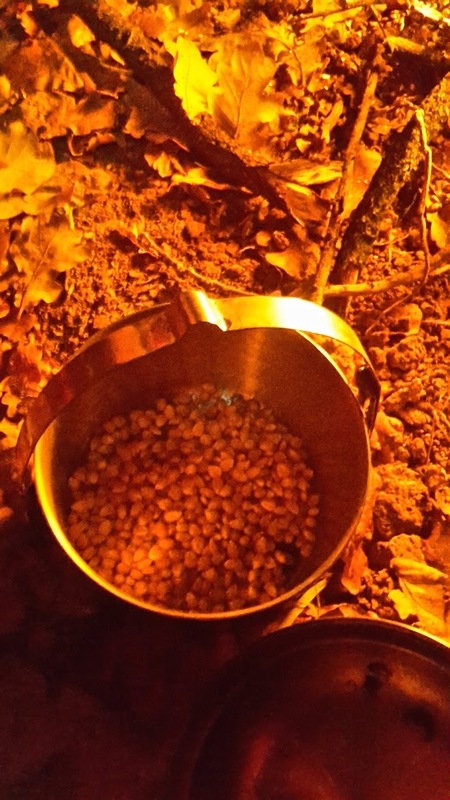 The popcorn could be grown and used just as a normal grain then used for flour. But it doesn't have to stop there. Out in the shed I've got wheat for my chickens, oats for the sheep and sunflowers for the birds. These could all be grown easily. The wheat could even be eaten as wheat grass or ground to make flour and the rest grown for another crop. The other thing would be to look in peoples gardens and see what gone to seed, or what young plants are growing (depending on what time of year it is) but you need to have a good gardening knowledge to be able to do this well. Where else do you think you could look for good sources of growing material? What would we find around your kitchen and garden? Labels: gardening, prepper, prepping, survival, survival gardening, survival growing. Having the scaffold up on the house has given me a different view of the veg garden. Here it is in all it's glory! I've been steadily altering the beds down the right hand side to be narrower, 30" wide rather than 4ft wide. I'll alter the left hand side in the spring after I've had my winter crops out. I'm also digging up my nursery bed at the end which contains around 100 young fruit trees or so to be put back into production as veg beds. I'm hoping to either plant or sell the fruit trees (mainly apple trees). Hopefully down this main strip that should leave me with thirty 30" by 10ft beds, fifteenth either side, plus two larger beds at the top, by the greenhouse, to be herb, flower and experimental beds. This should be great for crop rotation and to mean we can grow more, as we've become a bigger family over the last few years we're suddenly eating a lot more, so the more I grow the less it costs! All good in theory, I just hope I can keep on top of them. 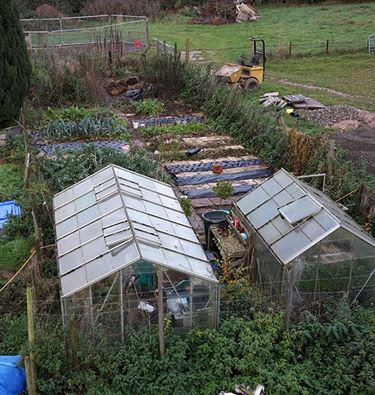 I have big plans to use plastic mulch, green manures, cover crops and inter-cropping to make sure I don't have too much space bare for weeds to take hold (again). I also have plans for other areas to be used as growing areas, but I know I need to learn to not bite off more than I can chew all the time! What do you think? Will I keep it under control? I'm trying to tackle my mouse problem in the garden before they get out of hand. A few years ago they ringed a lot of my young fruit trees which would have killed them if I hadn't inarched them with new root stocks. I've decided to be a bit more proactive in my approach and get them before they do any damage (I've got a lot of young fruit trees in my nurseries) and I don;t want to use poison if I can help it. This is purely for selfish reasons, I don't want rat poison being carted off by the mice and then going into my soil or the children finding it. I watched a lecture by Eliot Coleman the other day on YouTube and he was giving his answer to keeping mice under control. 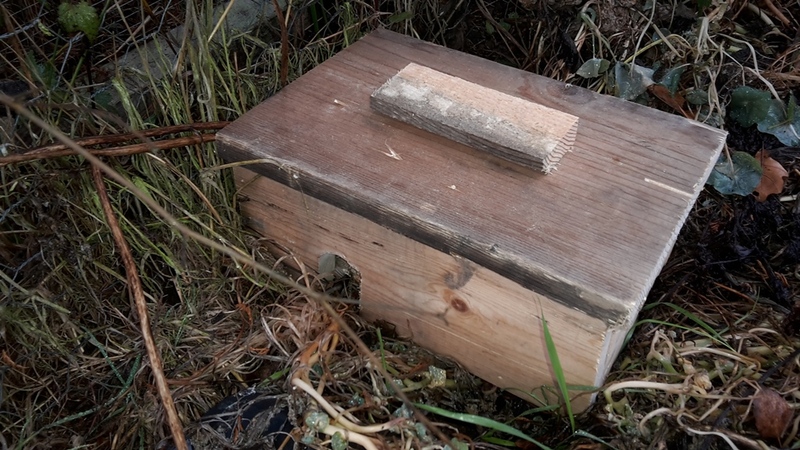 Little trapping stations set out in the field. He doesn't bait them and just relies on a mouse's natural love of going into dark spaces and tunnels. 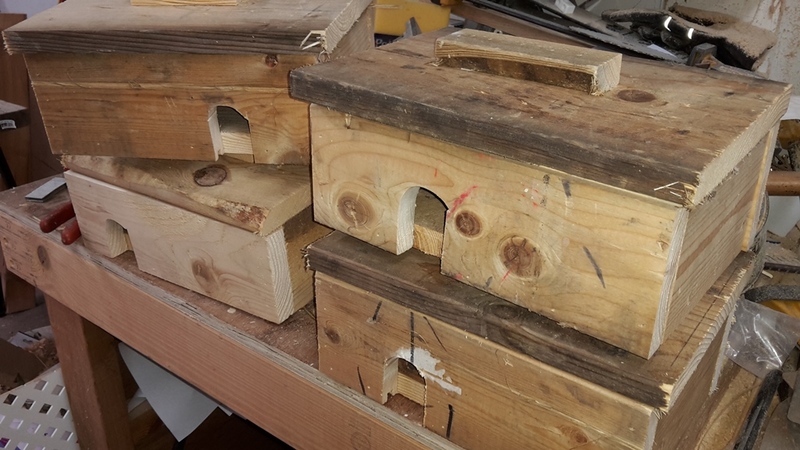 So I bought some fancy new mouse traps (I get fed up with cheap wooden ones that are tricky to set and make a real mess when they kill the mouse) and knocked out a few little "mouse houses" out of some old wood in the workshop. I think the downside of these is they look too cute for their own good. "Ahhhh, look, a lovely little house for a mouse..."
Inside they each have two traps ready to go and a lid that is easy to lift off and check each morning. 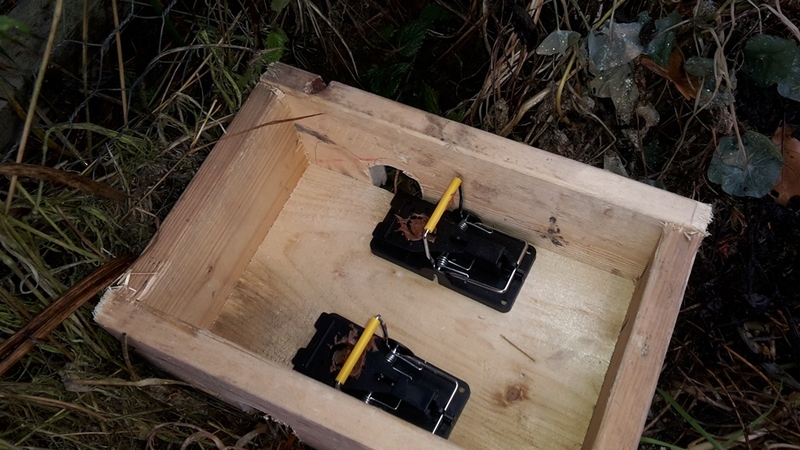 I set four trap stations yesterday afternoon and caught three mice when I checked them this morning, so not a bad start. With anything like this I think consistency is the key, I need to make sure I keep checking and resetting these traps so they constantly keeps numbers down. I'm going to make a few bucket traps next as well, as these have been recommended to be before, and see how they do. How do you deal with mice in the garden? Do they cause you much trouble? One of my favourite projects I've made has been my Tin Can Storage Door. I made this a couple of winters ago and we use it most days. It makes the small space I've got set aside for food storage so much more useful, it clearly displays all the tinned food, rotates stock and takes up very little room. I know I posted about this when I made it but I thought I'd do a little video of it in action. Sorry I'm so full of cold in it! I sound quite bunged up! My little girl is super cute at the end though - what a little star! Has anyone else made anything similar? Let me know what you think and share the idea with friends so they can increase their food storage as well! Heavy frost last night so that means I get to harvest my Yakon and try them for the first time! Watc the video and let me know what yopu think. Do you grow this type of tuber? What do you do with them? First off I'd like to say thank you to everyone that left a comment about my washing machine troubles. I'll do a post about how it was resolved tomorrow, but I'm always so impressed with the response I get here, I love this little blogging community we've built up! Now on with today's post. My eldest daughter , who is currently in reception at the village school, does a initiative call forest schools on a Monday afternoon at school. She absolutely loves it. I think this is a great idea where the kids get to go out and play in nature, they're encouraged to explore and climb trees and the sessions can be as simple as collecting leaves and as they get more older they even have camp fires. The only downside is that they're required to wear gloves at all times (I'll rant about that another day) and they only do it for the first couple of years at school before "real" learning takes over the timetable. Both my girls love being outside and this is something I love to encourage (as it's where I like to be as well). With the darker autumn and winter nights it becomes harder as once we're back from the school run it's already drawing in. So last night I decided to take the girls out for an hour before tea. My sister-in-law, Helen, had been over all day looking after the children whilst I did some roofing so she came out with us and as my wife just got home from school she looked after the baby inside (he's full of cold). I asked them if they wanted to make a fire so they picked a spot in the future pig pen. they cleared off a small area and then used their torches to find firewood and kindling. I then lit the fire (after a couple of attempts) and we all sat round and talked about what we could cook on it. 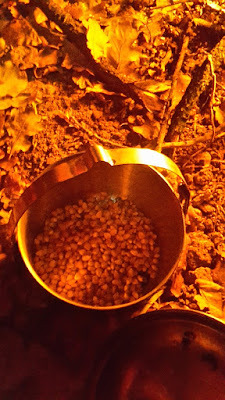 I bought out one of my bushcraft cooking pots and some popcorn so we we popped some of that once the fire got hot enough and I gave the girls a couple of glow sticks to play with. I think this is a great way to make sure they''re not afraid of the dark! The pop corn burnt, but it didn't matter. 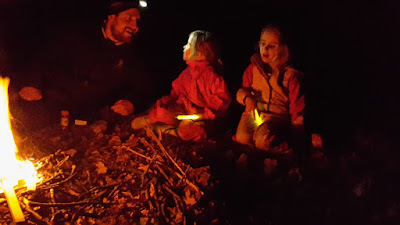 The girls loved sitting and talking about things and it was great to be out there with only the fire as a distraction. "Is it alright if I can stay out with you and watch the fire go down daddy?" I think my heart melted a little bit when she said that! So we sat on the dirt and watched the flames die down and talked about everything and nothing. 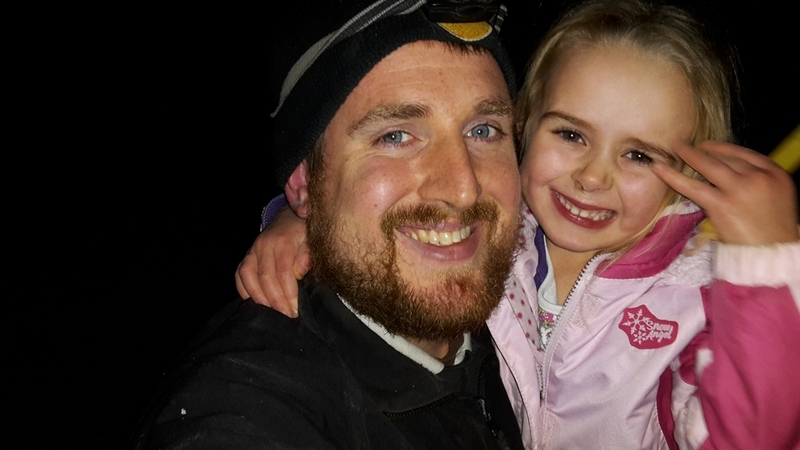 When we got back to the house she wanted to get the fire wood with me for the log burner and kept telling me what a fun night it was. A great thing to do with the kids and something I want to start doing regularly. I think that sitting round a fire like this is in our DNA and it's a great way to spend quality time with ones that we love. Who else just loves to sit by a fire outside? I've had the washing machine on it's back so many times over the last month that the wife thinks we're having an affair! But believe me when I say that these aren't amorous advances and a quick fondle over the kitchen worktop. It's just the bloody thing keeps breaking down. It's mainly to do with it draining, the machine spins the washing but nothing is dry. I've had it apart, removed blockages, and put the ball float back in place (which doesn't stay there long) - but I think after 9 years of service I'm going to admit defeat and invest in a new one, not the ideal time for us to be doing this but then when is? I like the look of the large drum, high capacity machines that are energy efficient (although I don't the prices!). I'm hoping that less washes and a higher spin would make life slightly easier. Does anyone have any recommendations when it comes to washing machines for a young family? Or should I just persevere with my washing machine affair?